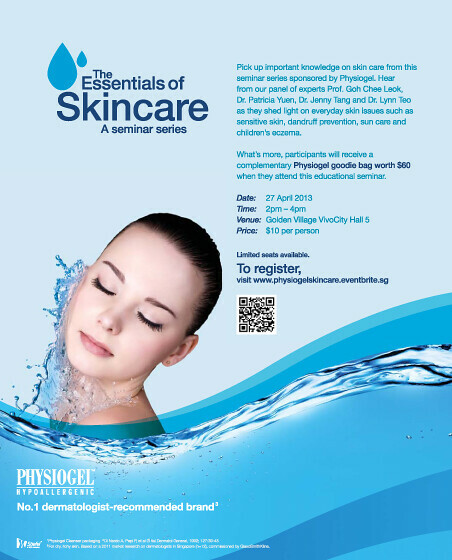 “The Essentials of Skin Care” Seminar Series will be held at Golden Village VivoCity Hall 5 on 27 April 2013 (Sat), between 2pm – 4pm. During this seminar, there’ll be a panel of doctors that would be talking about skin in general, common problems such as eczema, dandruff and scalp disorder, as well as solutions to these problems. This skin seminar is not a platform to hard-sell products, so don’t worry about it. There will be plenty of interesting and useful topics, so I’m sure you’ll be able to pick up some valuable knowledge from the seminar itself. Golden Village VivoCity Hall 5, 1 HarbourFront Ave, Singapore 098585. The booking page for this seminar is at http://physiogelskincare.eventbrite.sg/. Ticket is priced at $10 each and in return, the participant will receive a Physiogel goodie bag worth $60. I will be attending this seminar, see you there!